Hopes for immortality for most people go with the children they prepare for the next generation. For me, 'Anesthesia in Cosmetic Surgery' is that 'child.' I labored for three years in the actual manuscript preparation but twelve (unintentional) years laying the groundwork to be selected for the honor of being chosen to write and edit the manuscript. A 1990 office cosmetic surgery patient death was the impetus for the beginning of my career in office based anesthesia. Like so many other pioneers before me, I stood on the shoulders of others. Quite by accident in December 1991, I attended a lecture by Charles A. Vinnik, MD, a Las Vegas plastic surgeon, who spoke about his surgeon-directed diazepam ketamine intravenous sedation technique for office cosmetic surgery. I visited Vinnik's office in early March of 1992, deleted his diazepam, inserted propofol, followed his paradigm, and gave my first propofol ketamine intravenous sedation anesthetic in Newport Beach on March 26, 1992 in the same office that experienced the 1990 death. Computer searches were very limited, at least my ability to perform them were, so I could not find anyone else's work to guide me. Only after six months of trial and error working with the information Vinnik provided me did I begin to understand there were some things that were very different about propofol, a short acting hypnotic, than diazepam, a drug with an 18 hour half life. After six months, I noticed that none of my patients experienced any postoperative nausea or vomiting (PONV), even the ones who had previously done so with other anesthetic experiences. I also noticed very few had any discomfort after surgery that required treatment. I really thought I had found something quite fantastic and submitted my first 50 PK cases for a poster demonstration at the next Society for Ambulatory Anesthesia (SAMBA) meeting. The SAMBA meeting was held in Scottsdale in the spring of 1993. I was so proud of what I had found that I was totally unprepared for the savage criticism that I received there and continued to receive I attempted to advance what I, my surgeons and my patients, perceived as a wonderful, simple, safe alternative to general anesthesia for office cosmetic surgery. 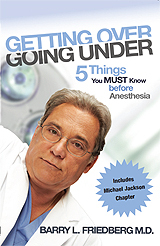 By the time my editor chose me first among the then 40,000 US anesthesiologists for the task of producing this book, I had already published four peer-reviewed articles, two chapters in the Clinics, numerous letters to the editor, and several articles in non-peer-reviewed journals including the SAMBA and CSA Newsletter. In addition to my own writing, my papers had been cited by 38 other journal article authors and seven anesthesia textbook authors. I also made twenty-five presentations of my work nationally and internationally prior to 2004. In short, I did everything short of a Level I RCT to validate and promulgate the use of PK anesthesia for patient safety in cosmetic surgery.